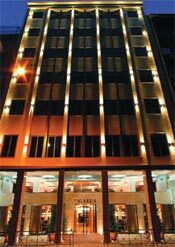 Conveniently situated in the heart of Athens near central Omonia Square, the luxurious Alassia Hotel is just a breath away from the historic district, the exciting shopping areas and the vibrant nightlife spots of the capital. Combining elegant ambience with high standards of personal service, this establishment was recently reconstructed and reopened in 2002. The hotel's 82 soundproof spacious and comfortable guestrooms are appointed with all modern amenities including air-conditioning, direct dial telephone, internet connection, electronic safety boxes, mini bar, hair dryer, Satellite & Pay TV, music and bath or shower WC with telephone extension. The main restaurant serves a rich American buffet breakfast, while refreshments can be enjoyed at the lobby bar. Room service, laundry service & dry cleaning, currency exchange, car rental, Internet access and secretarial services are also available. Its discreet atmosphere and convenient location make the Alassia Hotel the ideal venue for confidential and secure corporate meetings, private lunches and dinners. The hotel's conference facilities comprise a meeting room for small business meetings of up to 12 persons, featuring telefax, photocopy machine, scanner, printer, telephone, Internet connection, TV and video.